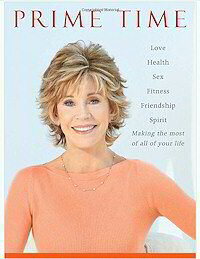 I was recently reading Jane Fonda’s new Prime Time book (having really enjoyed her autobiography a few years back). In both, she talks about the power of reviewing one’s life and the positive impact doing so had on her ability to navigate her next chapter with grace. In reading her thoughts I kept thinking about my work with Life Maps over the last two decades … my own, my clients and also the coaches I now teach to do this powerful work with their own clientele. Consistently my coaches tell me how this exercise is their favorite — even if initially they were reluctant to do it. What’s a Visual Life Map?! A visual Life Map is a visual depiction of your life journey … using visual coaching methods either on your own or with the assistance of a Certified Visual Coach®. It’s either a small size or large size mural of the journey you have taken over your life to date. In the way that I do them and teach them … they are focused not so much on what happened to you (although that is one layer) but more importantly upon how you choose to interpret and apply meaning to the events of your life — a very important distinction! As your thoughts and feelings are what really creates your life. Life Maps are good to do when you are in a transition or a contemplative mood — on their own or as a strategic warm up to doing visioning and action planning about the next phase of your life. They are also extremely helpful (when used with a good coach or therapist) to understand and resolve past events that have interfered with your quality of life. in my signature SHIFT-IT System®. They help you step back and appreciate your life story from a witness perspective. See the flow of your evolution. Your high points and low points. The people, places, things, events and activities that have shaped your life. And, most importantly … the beliefs that you have attached to yourself, life … and to the particular areas that you want to SHIFT. The visual approach takes oral or written storytelling up a notch — as you literally SEE your story, as you are currently telling it. As a coach this visual documentation is invaluable. It is a record of how my clients view themselves, their story and their life. Life Maps help people see how they are creating their reality, by observing the thoughts and meaning that they apply to what they’ve been through. When standing back and looking at their full story, they begin to see patterns and gather insights. And see the programming they will need to SHIFT in order to create more of what they DO WANT (rather than what they don’t). Life Maps are great for catching your insights and ahhas and for turning your attention to what you have received and what you are grateful and appreciate of — a prerequisite for personal visioning and planning work. They also serve as great communicate tools to explain and share your journey with important others (friends, mates, children, counseling professionals, etc). These maps are also good for releasing: identifying and letting go of the things (attitudes, patterns, people, places, etc) that no longer serve. Some of my clients choose to use their maps in a symbolic or ritual kind of manner — burning, shredding or disposing of them in some other kind of fashion (one client reported she threw hers off of Golden Gate Bridge – not the most environmentally friendly option, but definitely dramatic!). 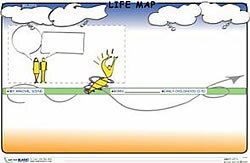 Life Maps are essential for clearing the slate for personal visioning and planning work. Often people need perspective and context before they can contemplate options for their future. The Life Map allows a nod to the past, but also sets the stage for more. The process naturally leads up to the present moment — to ‘what’s next for me?’ considerations. Your future does not need to be constrained by the past. Acknowledging and accepting the past (and putting it in its rightful place) clears the air for more empowered creating – as a person in charge of your own destiny. So your future is more a product of what you now want as opposed to just being an unconscious extension of what has always been. If you are a do-it-yourself type person and would like to do your own personal visioning and planning work (including constructing your own Life Map) check out my SHIFT-IT Home Retreat Kit. If you are a group person who likes the structure and support of working through your process in the company of like-minded others … then consider attending The SHIFT-IT Online Group – includes The Kit plus 7 weekly webinars and online forum. I facilitate groups twice a year (usually October and February or thereabouts). If you would like the help of a qualified coach to privately assist you with your Life Maps and other processes, consult the Visual Coach Directory for a coach in your area. If you are interested in becoming a Certified Visual Coach® yourself, see Visual Coach Certification for details and application process. Cohorts form each year in April … you’ll need to create your own Life Maps (as well as the other maps in the SHIFT-IT System) as prep for Certification.